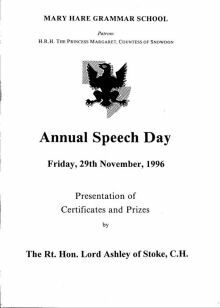 Programme for Annual Speech Day, Friday 29 November 1996. The Chairman of the Board of Governors will preside and make an opening address. The Chairman will ask the Principal to present his Report. The Chairman will invite the Guest of Honour Lord Ashley to present the prizes and address the meeting. Lee Stickings, the Head Boy, will propose a vote of thanks to the Guest of Honour. Fiona Ng, the Head Girl, will propose a vote of thanks to the Chairman and the Governors. The Pupils will sing the Commemoration Hymn, followed by the National Anthem. After the ceremony refreshments will be served in the Blount Hall.